The distance from Manebhanjan to Sandakphu is about 32 kilometers. From Darjeeling, the distance to Sandakphu is 58kms (26km up to Manebhanjan). But once you reach Sandakphu after a tedious trek, you will be rewarded with the real bounty of the nature. If you love snow peaks, then you will feel privileged that you made it up to this point and joined the group of few who have witnessed an end-to-end panoramic views of the Himalayan peaks. And these include four of the five highest peaks of the world. I shall come to the view shortly. The name Sandakphu means "Height of the poison plants". This is because of the poisonous aconite plants growing in abundance here and Sandakphu being the highest point of Darjeeling hills where such plants grow. Don't worry, they won't reach any harm to you unless you try to eat the attractive purple blue colored flowers or the leaves of these handsome looking plants that are usually 1-meter in height. Sandakphu is also home to lovely flowering plants like primula and rhododendrons that bloom in plenty in spring. 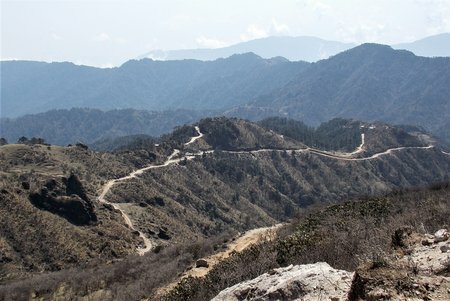 The last stretch of the route from Bikheybhanjang up to Sandakphu (4kms) is really steep. This stretch and the slopes of Sandakphu area are full of silver firs, rhododendron trees and magnolias. 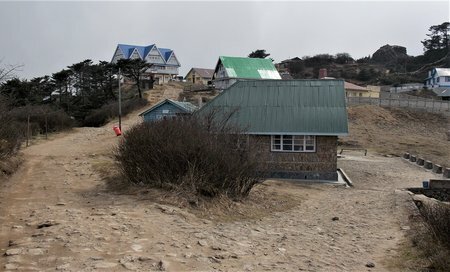 Sandakphu is a small village with few huts, GTA (Gorkhaland Territorial Administration, erstwhile DGHC) trekkers huts and few other private lodges for tourists and trekkers. Now about the view of snow mountains. From Sandakphu, you get a 180 degree view of the Eastern Himalayas, with ranges that belong to Nepal on the west, Sikkim and Bhutan in the middle and Arunachal Pradesh in the east. The entire range from Nepal to Arunachal is about 320 kms long. But the most dominant in the range are the Everest and Kanchenjunga family of peaks. The best time to view the snow peaks is when the day breaks at the wee hours. The best season is between April to May and from October to November. As the first sunlight strikes, you will see the dazzling peaks of the Everest family in Nepal at the far west including the gorgeous Mt. Everest (29,029 ft., the highest peak in the world). It is about 160kms away from Sandakphu. You will find it along with other peaks like Lhotse (27940 ft., the fourth highest peak) and Mt. 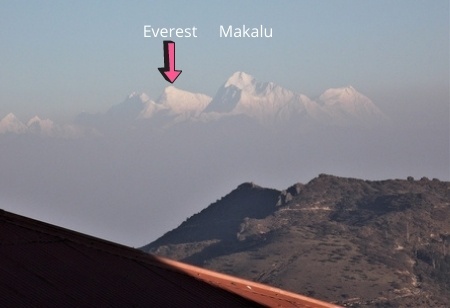 Makalu (27,825 ft, the fifth highest peak). If you look further west, you will see the Chamlang (24,006 ft) that stands like a square wall of snow. If you now start looking towards east at Sikkim, you will see the striking and prominent peaks of Kanchenjunga family (summit 28,156 ft., the third highest peak in the world). The name Kanchenjunga means "Five treasures of the snow" and has five snow peaks in its family. It is characterized by massive mass of snow. Buddhists call it 'Sleeping Buddha' and this massif is considered a holy deity in Sikkim. It is because of this sacred belief, mountaineers are not permitted to climb to the peak of Kanchenjunga. Other peaks close to Kanchenjunga include Kabru (24,026 ft), Kumbhakarna (25,294 ft.) and Pandim (22,010 ft). Between Everest and Kanchenjunga you will see the peaks of Three Sisters. If you look further east of Kanchenjunga, you will see the great Tibetan peaks of Narsing, Dongkya and Chola. And then you can spot Chamolhari in Bhutan. There are also several other private hotels here. One of my personal favorites is Hotel Sherpa Chalet. It has rooms with great views of Kanchenjunga (Phone: +91-97727691127 / 9742621760). Other private hotels includes Hotel Sunrise, Namo Buddha Hotel etc. I too went to Singalila in October 2016 for which I came into contact with Mr. Keshav Gurung and he gave me the contact number of hotel Namo Buddha at Sandakphu and Hotel Pradhan at Manebhanjan. Mr. Gurung is a nice person. As per his advice I deposited the required amount to stay at Shikhar Lodge. After reaching Tumling I got a warm reception from Nila Gurung (owner of Shikar Lodge). At Sandakphu I was fully satisfied by Mr. Samten Sherpa of Hotel Namo Buddha. When I was coming back from Manebhanjan I met Mr. Gurung along with my daughter. Overall it was an amazing experience... courtesy of Mr. Gurung. Hi, in Feb routes are likely to be closed to vehicles due to heavy snow. Thank you for your wonderful post. Now, I am planning to visit Sandakphu from Darjeeling to take some photos. I am planning to take only a day safari tour from Darjeeling. Is the sunset of the mountains eg Kanchenjunga equally as nice as the sunrise? By the time the jeep gets there, I think the sunrise is over. Are the roads safe to travel at night if I were to travel at night to catch the sunrise? And how long is it from Darjeeling? Many thanks! Yes, both sunrise and sunset views from Sandakphu are excellent and offer the spectacle of changing colors on the snow peaks. There are sunrise and sunset points in Sandakphu to get the best views. But day safari from Darjeeling wont serve the purpose. It can easily take over 5 hours one-way from Darjeeling. I shall not recommend night driving at all on this route because the gravel road is steep at many places and full of sharp turns. There is also a possibility of fog blocking the views. 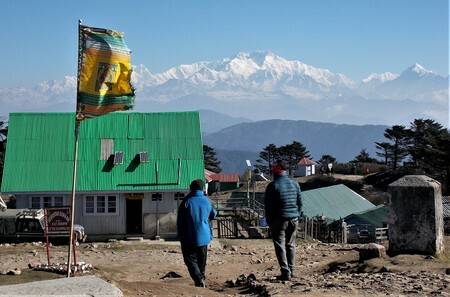 You should plan an overnight stay at Sandakphu to view sunrise or sunset. Routes will likely be closed beyond Tumling. But you can still see lots of snow around Tumling.